The pomegranates are ripe early this year. 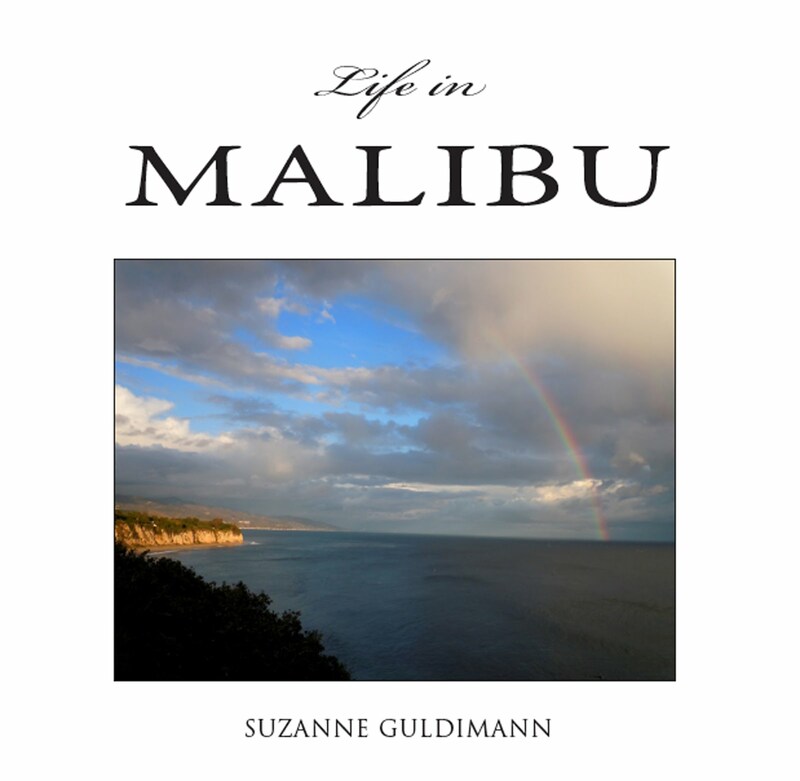 They bring to drought-parched Malibu gardens and the prosaic ordinariness of the grocery store or farmers market a jewel-like glimpse of something ancient and wondrous. 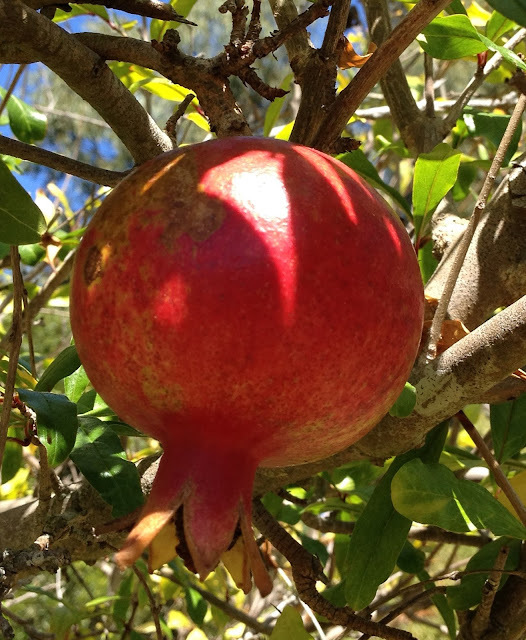 The pomegranate tree, Punica granatum, is a tough desert survivor that seems to thrive in the drought and heat. And this year, in gardens and backyard orchards all over Malibu, trees are bowed under the weight of red fruit, weighed, too, with myth and story. 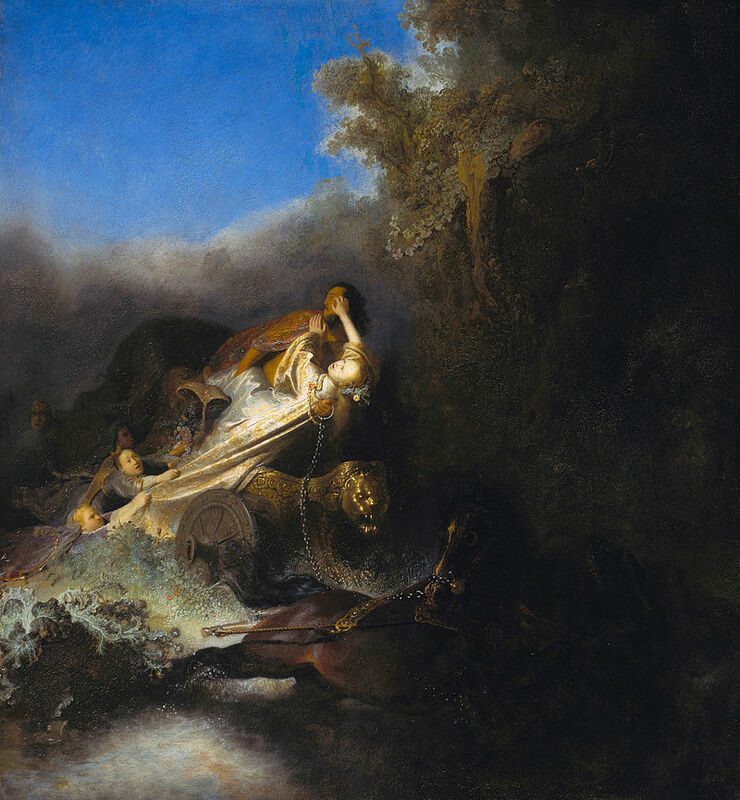 Rembrandt Van Rin's version of the abduction of Persephone, painted c. 1631, depicts Hades carrying off Persephone in a golden lion chariot. You remember the story, don’t you? The one about Persephone, the daughter of Demeter and Zeus, who strayed too far from her mother’s watchful eye while gathering flowers and was caught by the grim king of hell and taken to the land of the dead? 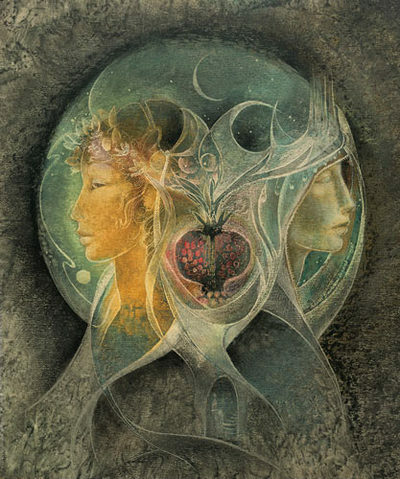 Artist Susan Seddon Boulet's interpretation of Persephone and Demeter. The pomegranate becomes a heart, the symbol of the bond between parent and child. In grief for the loss of Persephone, the sun grew cold and the plants withered and died. Demeter, the harvest goddess, begged Hades to release her daughter, and at last he agreed, but Persephone had unwittingly bound herself to the underworld by tasting the pomegranate offered to her by the king of the dead. 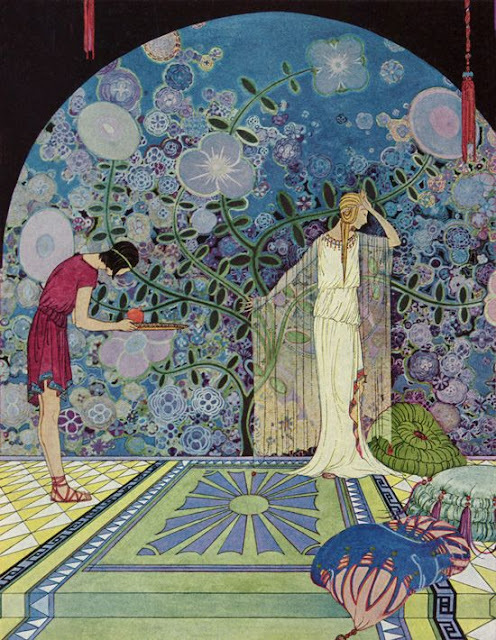 Persephone turns away from Hades' servant who has brought her the fateful pomegranate in this art nouveau-era illustration by American artist Virginia Frances Sterrett. Because of this, she is allowed to return to the sunlit lands in March, bringing Spring with her, but must return again ever autumn to the underworld. 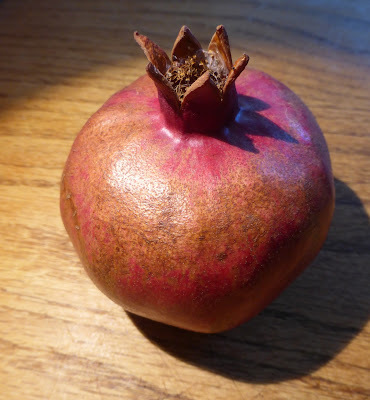 That’s why, according to the storyteller, the pomegranate ripens in the fall—to remind the goddess of her promise. And it's why the bright orange flower blooms so early, a reminder that winter, unlike death, is not eternal. Perhaps these natural characteristics are why this ancient fruit, thought to be one of the earliest cultivated plants, is associated in so many other cultures with death and rebirth. 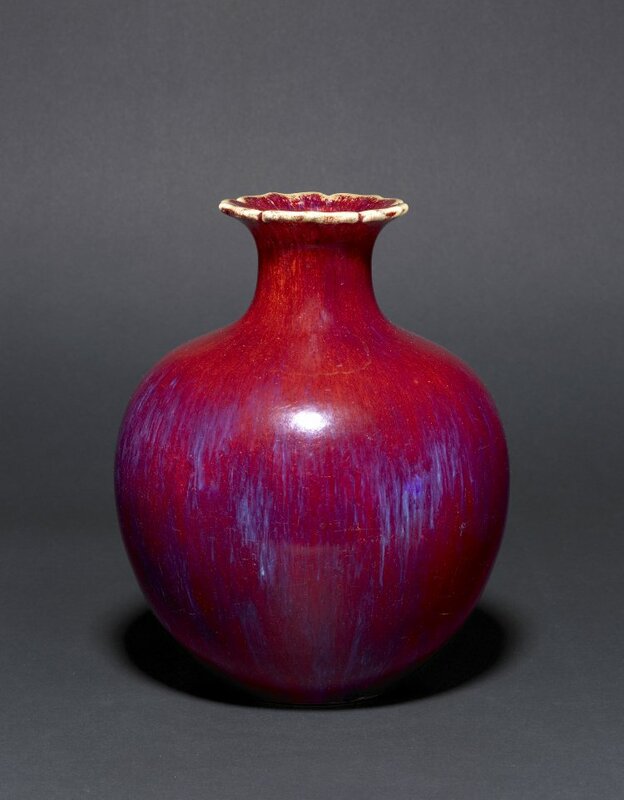 The pomegranate is said to have originated in what is now Iran and Pakistan. 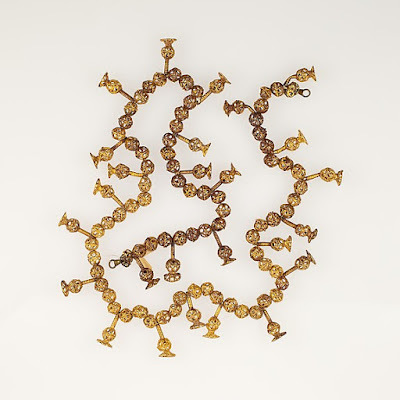 It spread through trade deep in antiquity across Asia, the Mediterranean, and North Africa. 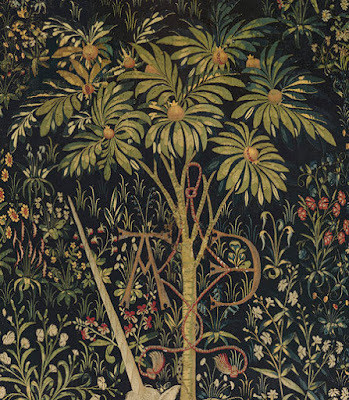 There's a popular myth that says the Romans brought the pomegranate from North Africa to Italy, based perhaps on the source of the Latin name Punica—the Roman name for the City of Carthage (granatum, the other half of the Latin name, means full of seeds, and it gives us the words grenade, from the shape of the fruit, and garnet, for the color). However, there are depictions of pomegranates in Etruscan art, proof of its existence in mainland Italy during pre-Roman times. The fruit also has a long history in Greece, Turkey and Sicily. In fact, the Sicilian town of Enna has long been identified as Persephone's home. 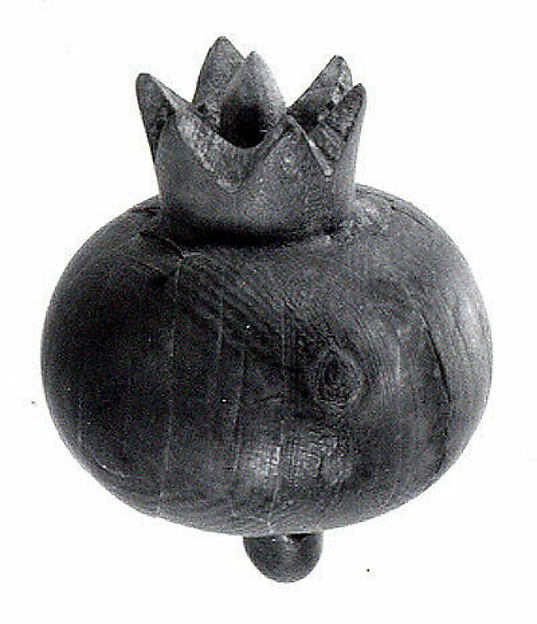 And the pomegranate was already being cultivated in Sumeria, Egypt and the Indus Valley for at least a thousand years before it arrived in Europe. This tiny Assyrian pomegranate—it's just an inch and a half tall—is carved from ivory. It dates to around 900-800 BC, and is in the collection of the Metropolitan Museum of Art. Here's another example of pomegranates in Assyrian art, this time on a 3000-year-old cylinder seal. 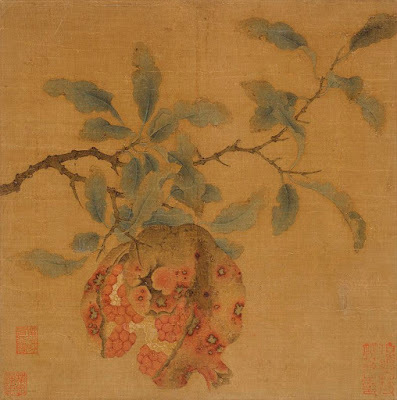 Here, the pomegranate is a symbolic representation of the tree of life. 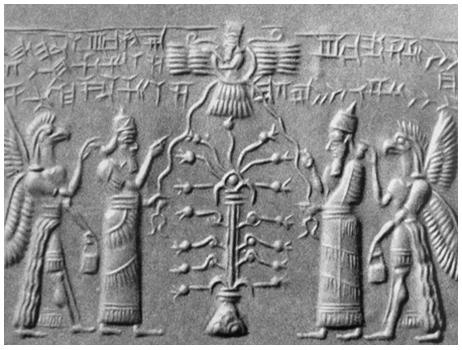 Some researchers hold that the tree of knowledge in the Old Testament was a pomegranate, not an apple, which would certainly be consistent with the Assyrian tree of life motif, and the Greek theme of temptation and consequence attached to this fruit. The pomegranate has witnessed the rise and fall of the Egyptians, Sumerians, Assyrians, Minoans, Myceneans, Carthaginians, Greeks and Romans. This tree is mute witness right now to the destruction of Syria. 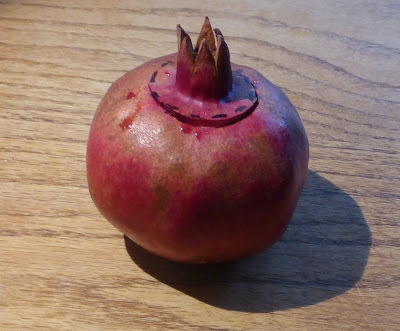 In more stable times, many varieties of pomegranate would have been sold in market places that are now rubble, and enjoyed by families who once had homes and are now scattered and broken. By the sixth century, the pomegranate and its ancient symbolism had been absorbed by the Catholic Church. The fruit became a symbol of the resurrection of Christ instead of the goddess, and it was now an emblem of hope. Here's a closer look at the tree: the fruit are definitely pomegranates, even if the leaves are strange. The artist may never have seen the plant, only the fruit, which was a trade item throughout the Western world. The Spanish brought the pomegranate to the Americas in the 17th century. 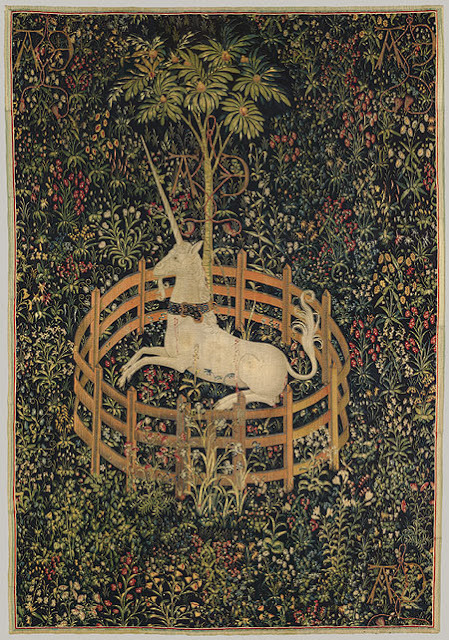 It arrived in California in mid 18th century, with the missionaries, and has remained to become both a commercial crop and a much-loved garden plant. The only point of contention this fruit causes is how to eat it without ending up looking like the survivor of a horror film. If it is left on the tree long enough, the fruit eventually bursts open on its own, but for impatient pomegranate eaters who would rather not wait or risk sharing the treat with wasps or ants, there are a variety of techniques, some so complex that it would be easy to imagine they are some kind of ceremonial holdover from the days when Persephone was worshiped as a goddess. 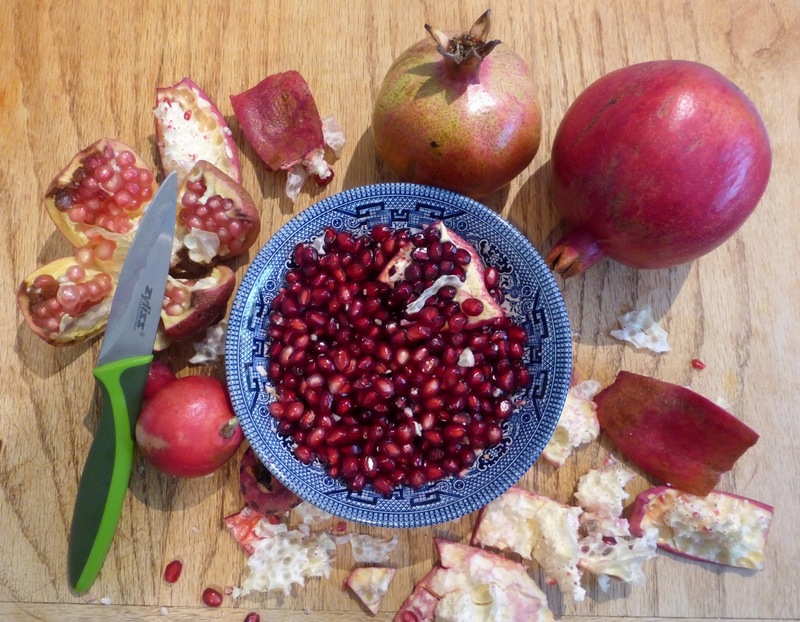 Anyone who has tackled a pomegranate the wrong way will not be surprised to learn that the flowers, rind and juice are a traditional source of fabric and leather dyes. 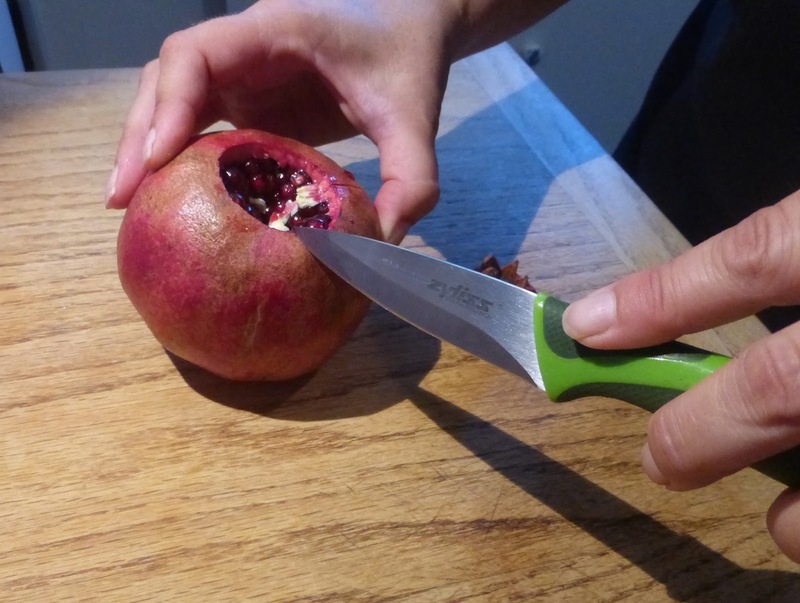 With a sharp paring knife, gently cut all the way around the blossom end, being careful to score the skin of the pomegranate but not cut into the arils—the official term for the juicy seeds. The blossom end should now be like a cork in a bottle. 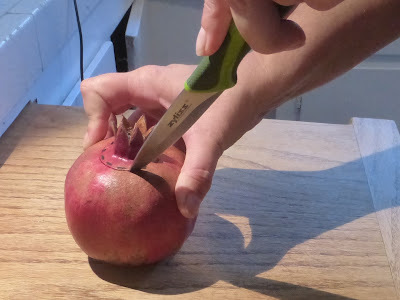 Pull it out and remove any of the white pith that is attatched to it. 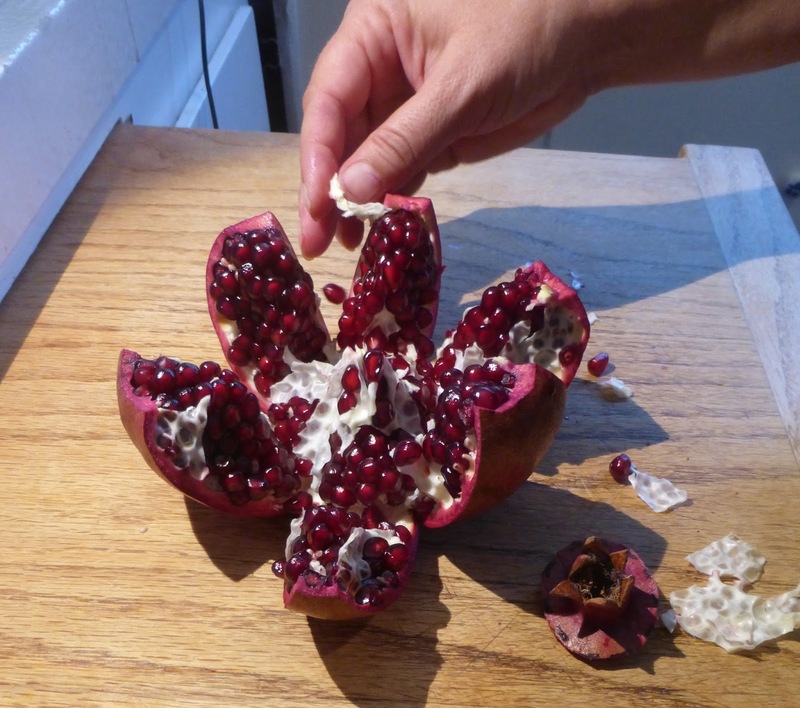 Look for the white membrane that separates the sections of seeds and carefully score the skin along every section, not cutting too deep and stopping before you reach the stem end of the fruit. 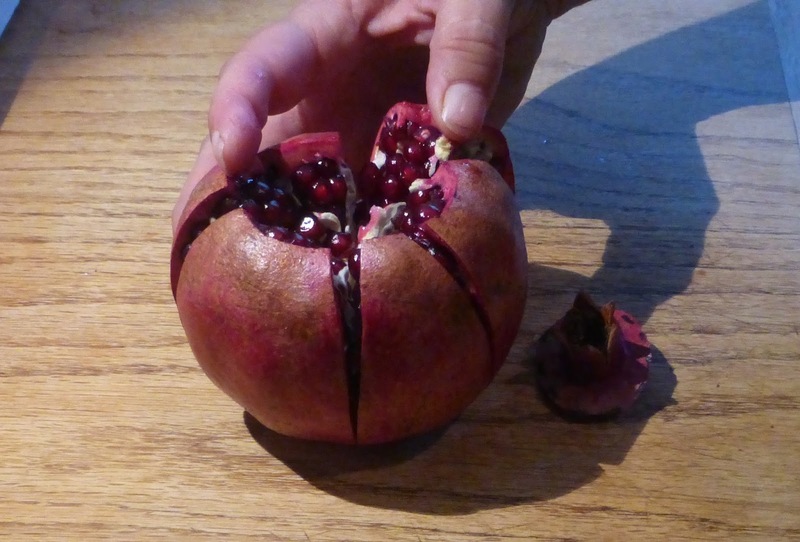 Pull the pomegranate apart. It should open like a flower. We have four kinds of pomegranates in the garden: "Wonderful," the large dark red commercial type shown in the demo photos, which my dad and I planted together nearly 20 years ago; "Ever Sweet," the pale pomegranate by the knife; "Utah Sweet," the greenish fruit in the middle; and a miniature type called "Nana," but there are dozens of varieties in a rainbow of colors from pale yellow to dark purple. Coastal Malibu is not always warm enough for pomegranates to set abundant fruit—the hot weather is the secret to this year's amazing—and early—harvest, but even in a year that doesn't produce many fruit it's an ideal Malibu garden plant, with bright orange flowers, leaves that turn yellow in the autumn, a compact shape that is somewhere between a large shrub and a small tree, and a good tolerance for poor soil and limited summer water. 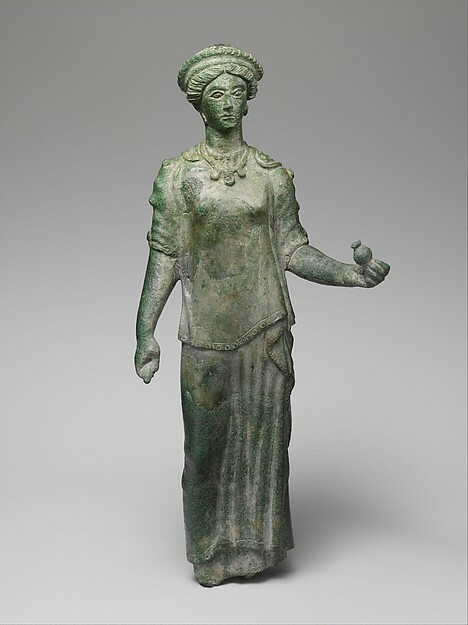 The Romans transformed Persephone into the goddess Proserpine, but she had already made the transformation in Greek mythos from Kore, the maiden, into the powerful queen of the underworld. According to Homer, Persephone enforces the curses of the living upon the souls of the dead, but she also sometime intercedes with compassion in the weighing of souls, and she grows the poppies that confer the gifts of sleep and forgetfulness to mortals. English Pre Raphaelite painter Dante Gabriel Rossetti envisioned Persephone's Roman persona, Proserpine, not as a child goddess, but as a darkly brooding empress, only the pomegranate offers the key to her identity. Persephone has dwindled from a powerful goddess to a story for children, but pomegranates are enjoying a surge in popularity in this country, due to their reputation as a "miracle food." 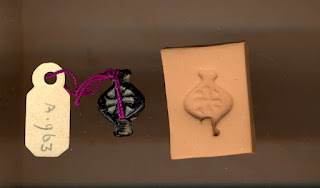 To me, the miracle is the history and mythology, bitter and sweet as the fruit itself, that continues to be rooted in this living link to the past.